Lantern Floating Hawaii Memorial Day Lantern Festival at Ala Moana Beach Park. Lantern Floating Hawaii: an Experience to Remember! The Shinnyo-en Lantern Floating Hawaii Memorial Day lantern festival at Ala Moana Beach is probably the most unique and visually moving memorial service I've ever witnessed. 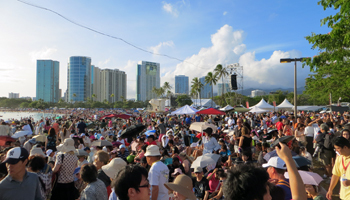 This inter-faith event was first held in Hawaii on Memorial Day 1999; and it has grown to become one of the largest observances of the holiday in the United States. At the 2013 event, tens of thousands of people gathered to witness the launching of six thousand floating lanterns bearing the prayers and remembrances of those who came to commemorate their lost loved ones. 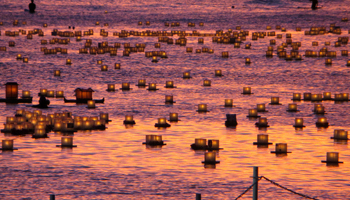 Lantern Floating Hawaii was the first Shinnyo-en lantern festival held outside of Japan; and it is an amazing event! The stage on which the ceremony is performed is so massive, it actually extends from the shore of Magic Island out over the water. 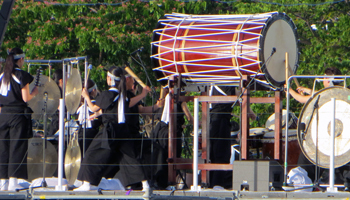 There are traditional Japanese and Hawaiian music and dance performances throughout the ceremony, which lasts approximately 1.5 hours in its entirety. The fire within the lantern is said to represent purification; and the water on which it floats symbolizes consolation. When mixed, these elements make for a powerful experience that keeps the light of remembrance burning bright in the hearts of the living while also bringing healing and renewal. Undoubtedly, countless people find comfort through the observance of the event and/or the act of floating their thoughts and prayers with thousands of others in one ocean. If you’re planning to attend Lantern Floating Hawaii so that you can float your own personal remembrance, you’re going to need to make a whole day of it. The Lantern Request Tent is located right on Ala Moana Beach, and it opens at 10am. I heard (but did not personally go early to verify) that people line up outside the tent even earlier than that because the lanterns are available only on a first-come first-served basis until they run out. Furthermore, the use of home-made lanterns is discouraged for a variety of reasons ranging from aesthetic to environmental. 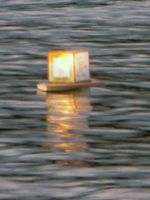 Honestly, I’d say that if you’re planning to attend in person, you really should participate in the lantern floating. That’s the experience that will leave an indelible impression on your heart and soul. And frankly, you plan a Hawaii vacation for the experiences – not just for observations. 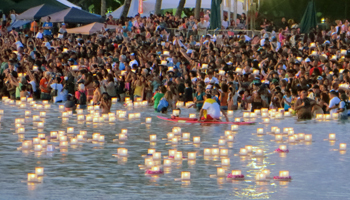 So if you’re planning just to be a spectator at the Lantern Floating Hawaii event, be aware that there will be at least 10,000 people between you and your ideal photograph. There will be another 10,000 people between you and everything happening on the stage. There will be another 10,000 people ahead of you in the line for the bathroom. And there will be another 10,000 people parked closer to the event than you parked. With these challenges in mind, if all you really want to do is watch a compelling ceremony and see some dramatic images, just watch the high-definition broadcast live on television or at the Lantern Floating Hawaii official web site. The professional videographers perform camera magic, and nobody will trample your picnic trying to get a better view! SUBSCRIBE and see new content when it posts. By Jake Quinn, Copyright © 2013-2016 Quinnformation LLC. All rights reserved.